* Share price as of close on July 14, 2015. Shares outstanding as of end of most recent quarter and exclude treasury shares. This Bridge Report provides details of Nihon Enterprise Co., Ltd. and information pertaining to earnings results for the fiscal year May 2015. Nihon Enterprise is a "mobile solutions company" with two main business segments including the contents services business, where various contents including lifestyle and traffic information services are created and distributed to smartphones and other mobile devices, and the solutions business, where contents creation, operations, systems integration, affiliate advertising, reverse auctions, IP phones and other business support solutions (Cost reduction) are provided. Furthermore, Nihon Enterprise is also promoting efforts to expand its business into overseas markets and has established a business platform for the provision of Japanese contents in China and India. Nihon Enterprise's employees have an obligation to maintain the basic corporate philosophy for eternity by repeatedly learning from the corporate philosophy reflected in its "Mission Statement, Doctrine, and Five Spirits" and "Nihon Enterprise Management Principles." President Katsunori Ueda believes that it is Nihon Enterprise's obligation to maximize "shareholder value" and "make effective use of capital by not wasting a single yen". From the start, President Ueda founded Nihon Enterprise with the strong motivation of "contributing to society through its businesses" and the Company pursues the achievement of this goal. Consequently, the Company seeks to contribute to society by increasing the satisfaction of its users through the provision of convenient information technology equipment and interesting and diverse contents and services. Based upon the management philosophy of President Ueda, the bulk of the ordinary Profit earned in the founding year of the Company was donated to the Japan Red Cross Society, the Japan National Council of Social Welfare and various children's institutions. Also, donations were made to the Japan Red Cross Society at the time of the Great East Japan Earthquake to support the victims and the reconstruction efforts in the Tohoku region. The Nihon Enterprise Group is comprised of eight consolidated subsidiaries including the company Dive Co., Ltd., which provides advertising services, At The LOUNGE Co., Ltd. which provides music related services, Advanced Traffic Information Services, Corporation (ATIS Corp.), which provides traffic and other information services, 4QUALIA Co., Ltd., which provides web and mobile site development and maintenance services and contents development, HighLab Co., Ltd., which conducts native application development as part of the mobile contents business, Enterprise (Beijing) Information Technology Co., Ltd., which operates cellular telephone retail shops in China, Beijing YZH Wireless Net Technology Co., Ltd., which provides mobile contents planning, development and solutions, and Rice CZ (Beijing) New media technology Co., Ltd., which provides IT related educational services. The Group also boasts of another four non-consolidated subsidiaries including and One, Inc., which provides voice communications related solution services, Aizu Laboratory, Inc., which provides smartphone application planning and development, Rise MC (Beijing) Digital Information Technology Co., Ltd., which provides mobile contents distribution and character licensing services, and NE Mobile Services (India) Private Limited, a local company operating in India. "and One Inc." and "Aizu Laboratory, Inc." became consolidated from fiscal year May 2016. Yamaguchi Regenerative Energy Factory Co., Ltd., was established in June 2015 to provide smart community services, and was turned into a non-consolidated subsidiary through the acquisition of shares through a third party private placement conducted in July. Promote, Inc., which conducts kitting tool business, was also added as a non-consolidated subsidiary in fiscal year May 2016. (Currently 10 consolidated subsidiaries, 4 non-consolidated subsidiaries). A characteristic and strength of Nihon Enterprise is its "devotion to in-house development". Nihon Enterprise maintains a unique strategy focused upon the development and ownership of its own contents created in-house as part of its unique business model. This strategy has also enabled the Company to expand sales of its performance based compensation (Success fees) contents through cooperation with cellular telephone sales companies to conduct affiliate program contents sales (In-Store affiliates developed independently). In addition, these experiences are leveraged in its mobile communications solutions for corporations. "Woman's DIARY" is an important specialized application that allows women to manage their physiological cycles. It allows women to record and manage various physiological characteristics including their menstrual cycle, and provides various health related information and advice. "ATIS traffic information"　provides unique ATIS highway and surface street traffic information, and other information including navigational routing, transfer, delays and other train operational information, parking lot, ferry, weather and other helpful information. With regards to the contents services business, Nihon Enterprise will endeavor to fortify its earnings structure through the provision of contents to official carrier fixed rate services along with global deployment of "contents platforms" through mutual collaboration with native and messenger applications. At the same time, consigned development for smart devices, business support services, advertising (In-Store affiliate) and collaborations (Alliance type) are expected to become growth drivers for expansion of the solutions business. Native applications is a term used to describe game and other applications which can be downloaded to and used on smartphones and other digital handsets. Previously, online browser applications had been used by feature phones because of their inability to download applications. In the near term, applications for smartphones provided to carrier fixed rate services and carrier official site monthly subscription services trended favorably. Consequently, smartphone sales accounted for 71% of segment sales during the fourth quarter (69% during the third quarter). Applications are provided across the carrier fixed rate services including "au Smart Pass (KDDI)", "Sugo Toku Contents (NTT Docomo)", "App Pass (Softbank Mobile)" and "Appli Chou Houdai (Source Next)". The current growth in sales is expected to continue on the back of the addition of contents and through provision across new fixed rate services. During the fourth quarter of fiscal year May 2015, provision of "Nekketsu! Yankee sports festival", "Yowamushi Pedal Sugoroku" (Provided to au Smart Pass), "Nadeshiko Fan!!" (Provided to Sugo Toku Contents), and "Natsume Yu-jin-cho Let's play with Nyanko sensei" has been started. 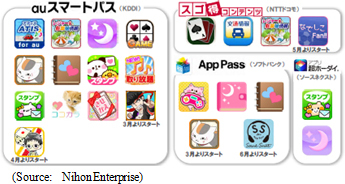 The largest volume of contents is provided through the fixed rate service of "au Smart Pass", which was one of the first platforms used, and highly popular contents are also expected to be provided across "Sugo Toku Contents" and "App Pass". With regards to native applications, social applications including games (Original native games), tools (Tool applications which can be used with other applications), healthcare (Health support application for women's hearts and bodies), and communities (Bulletin board style schedule sharing application) will be fortified. At the same time, Nihon Enterprise will pursue synergies (Deploying across "contents platforms" for smartphones) through coordination of these applications with messenger services ("Fivetalk" free chat application). The three applications "Honey Plus" (Android, iOS), "PasteLius" (Android), and "Brush up my dear darling" (Android) were introduced as part of the native application product lineup fortification strategy during the fourth quarter of fiscal year May 2015. During fiscal year May 2016, additional steps to fortify the native application lineup and improve profitability will be taken, including the introduction of healthcare and messenger applications. Collaboration between three applications newly introduced and "Women's DIARY, which boasts of 3 million downloads and some paid for services, has been conducted as part of a strategy of developing new contents in various stages of women's lives in the realm of healthcare applications. Specifically, new applications providing information about pregnancy (Reports, diagnosis, columns, diagnostic records, pregnancy records) and child rearing (Family information sharing, albums, educational games for children) are being introduced that leverage the core application "Women's DIARY", an application targeting women interested in marriage (Includes information regarding menstrual cycles, weight management, and basic body temperature management). At the same time, collaboration for the "Fivetalk" free chat application messenger applications with various companies and various other applications are being conducted. As part of these collaborations, "Fivetalk" has been provided as an onboard chat application for cars as part of the "Apps" application store of "T-Connect" next generation telematics (A service that provides various information to communications equipment and GPS systems) of the Toyota Motor Corporation. Various efforts are being promoted to develop new collaborations for "Fivetalk" with game applications to enable players to message other players, and other applications. The realm of website and application development services provided to corporations and local governments is expanding, along with the expansion of corporate business process support services, solutions for declining birthrates and "my number" tax systems (Consigned development and operations of applications and systems), expansion in "touch points" (Store numbers) and improvements in withdrawal rates and other collaborative efforts with In-Store affiliates designed to increase the advertising value. Along with the increase in system investments accompanying the recovery in the economy, the business environment for solutions is favorable. In addition, the arrival of the smart device age has led to an expansion in Nihon Enterprise's business realm and increases in its technological expertise. For example, in recent years IP telephones, smart grid, big data, Internet of Things (IoT) and other trends are on the rise. And from fiscal year May 2015 onwards, regional economy rejuvenation, Tokyo Olympics and Paralympics, "my number" tax and social security identification system are generating a growing range of services. Information communications technology (ICT) are leveraging regenerative energy to link families, schools, traffic systems, etc. to create local communities that promote more effective use of energy (Smart communities) and are being promoted on a global basis. Within Japan, efforts of the national and local governments and private sectors to realize the creation of environmentally friendly communities (or smart communities) are contributing to growth in solar electric and wind power generation businesses, and the leveraging of other regenerative energy sources. Amidst these trends, NTT Neomeit, which is a client of the consolidated subsidiary 4QUALIA Co., Ltd. that conducts contents development and web mobile site development and maintenance services, has been selected by the Ministry of Economy, Trade and Industry to participate in its "Smart Community Concept Diffusion Support Project" and has begun work on the "Solar Power Generation Verification and Validation Project" of Ube City in Yamaguchi Prefecture. Nihon Enterprise will leverage its office in Yamaguchi Prefecture and the extensive business and human network of its subsidiary 4QUALIA Co., Ltd. as a participant in the "Smart Community Concept Promotion Support Project", and has established "Yamaguchi Renewable Energy Factory Co., Ltd." as a joint venture company and subsidiary in June 2015 for the sale of electricity generated from solar power. Through this joint venture company, Nihon Enterprise seeks to contribute to the realization of smart communities and promote the smart community business as part of its efforts to rejuvenate regional economies. Company Name: Yamaguchi Renewable Energy Factory Co., Ltd. In the consigned development business, traditionally only a portion of the overall functions had been outsourced for development, but in recent years requests for entire systems to be developed have been increasing. This trend has led to an increase in the overall size of consignment projects. In addition, development for local governments and inquiries for FEMS, HEMS related work are on the rise recently. Therefore, Nihon Enterprise has endeavored to raise its technological expertise and expand the realm of its services. 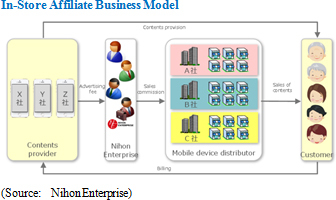 At the same time, Nihon Enterprise will endeavor to expand sales of the reverse auction "Profair" (Purchasing support system), "AplosOne softphone" (internal phone system function applications for smartphones), and messenger service "BizTalk" (Secured corporate internal phone communication application) in addition to fortifying its business support application development. FEMS is an acronym for Factory Energy Management Systems and refers to factory energy management systems. HEMS is an acronym for Home Energy Management System. EMS refers to solar power regenerative energy and electric power storage control systems that allow for electric power usage to be visualized (Monitored) and controlled for use in BEMS for commercial buildings and CEMS for overall regions. Implementation of regional declining birthrate countermeasure subsidies and the start of the "my number" tax and social security identification system are contributing to an expansion in demand for various solutions from local governments. And based upon experiences in work with the Chiba Prefecture Government, Nihon Enterprise seeks to expand its solutions services provided to other local governments. 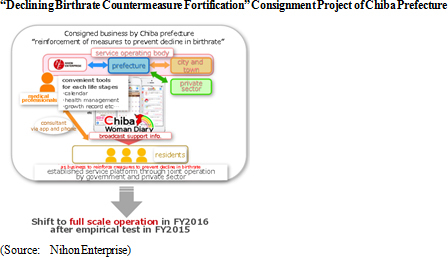 Nihon Enterprise boasts of a track record based upon its validation tests in the declining birthrate countermeasure fortification solution outsourced by the Chiba Prefectural Government during fiscal year May 2015. This project was based upon the service platform developed for smartphones called "Chiba Woman Diary" to provide various information and functions pertaining to and supporting marriage, pregnancy, birth, and child rearing. Specifically, a monitoring program was conducted for women who are at the stage of marriage, pregnancy, childbirth, and child rearing in 10 cities and towns within Chiba Prefecture. Under this program, various "support information," "specialized health and childcare information of medical and healthcare experts," and "calendar and other convenient health care management tools" have been provided over the "Chiba Woman Diary" platform to participants in the program (The results of the validation tests are being considered to determine whether or not operations of this platform will be continued). Nihon Enterprise has begun collaborating with cellular telephone sales companies, which have strengths in regions outside of the major metropolitan areas, to form In-Store affiliates first in the Kyushu and Tohoku regions, and then in the Chugoku and Shikoku regions. Currently, the Company is conducting efforts to expand its business in the major metropolitan regions, where competition is the fiercest. Because of a peaking in handset sales being encountered by cellular telephone sales companies, they are seeking ways to acquire new earnings sources and are open to pursuing collaboration. Nihon Enterprise will expand its "customer contact points" (Stores) by cultivating new collaborative partners, in addition to increasing advertising value by expanding the number of stores managed by existing collaborative partners, improving the performance of weaker stores, and reducing the withdrawal rates. Moreover, efforts will be made to strengthen advertising sales for feature phones where competition is not as intense as for smartphones. Sales rose by 13.5% year-on-year to ¥5.116 billion. By category of sales, sales of games within carrier fixed rate services doubled and traffic information within both monthly subscription and carrier fixed rate services trended favorably, allowing the contents business sales to rise by 1.5% year-on-year to ¥2.506 billion. Advertising (In-Store affiliate) sales rose by a large margin, boosting solutions business sales by 28.0% year-on-year to a record high level of ¥2.609 billion. Operating profit, on the other hand, declined by 43.4% year-on-year to ¥189 million. An increase in the share of advertising sales relative to overall sales and a rise in game development expenses caused cost of sales margin to rise by 1.5% point year-on-year to 52.9%. Strategic investments in advertising and human resources, and expenses for the move of offices of subsidiaries contributed to a 19.6% year-on-year increase in selling, general and administrative expenses. Declines in payment commissions allowed non-operating profit to improve, but declines in profits on the sale of investment securities (¥516 to ¥341 million) caused net profit to decline by 59.4% year-on-year to ¥177 million. A yearend dividend of ¥3 per share is expected to be paid. The commemorative dividend of ¥1 per share will be eliminated, but the regular dividend will be raised by the same ¥1 per share. During the fourth quarter of fiscal year May 2015, the booking of sales of large solutions projects allowed the solutions business sales to rise to ¥780 million. At the same time, game related sales rose on the back of aggressive advertising during the first half and effective introductions of new contents (Four fixed rate services, three native applications), but the arrival of a transitory period for the carrier business due to saturation of smartphones led to relatively weak demand for other contents within the contents business. With regards to costs, the transition from the member acquisition phase to the operational phase contributed to a decline in advertising expenses within the contents business. Total assets rose by ¥746 million from the end of the previous term to ¥6.288 billion due to the sourcing of over ¥1.0 billion through issuance of new shares (¥853 million) and a third party private placement (¥153 million) conducted during the third quarter of the current term. In addition, capital of consolidated subsidiaries was fortified (¥0.2 billion for HighLab, which conducts development of native applications, ¥0.1 billion for 4QUALIA, which conducts web and mobile website development and maintenance and contents development, and ¥40 million for and One, which provides voice communication related solutions). Current ratio improved from 451.7% during the previous term to 621.3% during the current term, fixed ratio declined from 36.5% to 25.5%, and equity ratio rose from 75.7% to 81.6% over the same period. A decline in profit before taxes, increase in tax expenses (¥381 to ¥421 million), and a decrease in income from liquidation of investment securities caused the net inflow of ¥606 million in free cash flow recorded during the previous fiscal year to turn to a net outflow of ¥200 million during the current term. However, funds sourced from the capital markets contributed to a ¥749 million year-on-year increase in cash and equivalents to ¥3.557 billion at the end of the current term. In addition to the anticipatory investments conducted during fiscal year May 2015, a decline in profits from the sale of investment securities contributed to a decline in net profit margin. The decline in leverage caused by the increased capital arising from financings was among the factors that contributed to a decline in ROE. Nihon Enterprise's earnings estimates call for sales to rise by 19.2% year-on-year to ¥6.1 billion during fiscal year May 2016. Growth in solutions and advertising sales is expected to boost sales of the solutions business. At the same time, contents and native applications provided to carriers are expected to trend favorably and to contribute to strength in the contents services business. Consigned development of applications for smartphone and tablets are expected to increase, and advertising sales are expected to grow on the back of development of new customers and strengthening of relationships with existing mobile phone vendor customers. Also, sales of the contents business are expected to rise on the back of fortification of contents provided to carrier fixed rate services, and promotion of "contents platforms" designed to increase collaboration between native game, healthcare and messenger applications. While fortification of marketing for healthcare and messenger applications will be conducted, the shift from the member acquisition phase to profit cultivation phase is expected to contribute to a decline in advertising expenses. Combined with the higher sales, operating profit margin is expected to improve by a large margin and to allow operating profit to rise by 2.4 times year-on-year. And while no contribution from sales of investment securities has been included in these estimates, net profit is still expected to rise by 7.0% year-on-year to ¥190 million. A dividend of ¥3 per share is expected to be paid at the term end. Nihon Enterprise views the return of profits to shareholders as an important management issue, and it seeks to implement a shareholder return policy of achieving a stable level of returns that are in line with earnings performance, cash flow, return on equity capital, equity ratio and the Company's future capital investment needs. Nihon Enterprise's participation in the smart community concept through its newly established subsidiary Yamaguchi Renewal Energy Factory Co., Ltd. is a highly interesting development. The Company will provide various lifestyle support services that leverage information technologies to individual households that are buyers of electric power and the solar power energy generation business is expected to become a stable source of earnings. There is a strong need for elderly care, medical and shopping related solutions to provide safety and security to the large number of elderly Japanese living alone in Ube City of Yamaguchi Prefecture, where Yamaguchi Renewal Energy Factory's headquarter is located. The potential contribution to society of such services is large. Aggressive advertising for native games contributed to a decline in profits during fiscal year May 2015, but profits would have risen if advertising had been held to the same level as in the previous fiscal year May 2014. Therefore, the impact of these aggressive anticipatory investments in advertising will have to be closely watched during the coming fiscal year. In addition, the growing size of solutions projects in the solutions business is also acting as an opportunity for Nihon Enterprise to grow its earnings. The firm establishment of profitability of native applications and the increase in project size of solutions are expected to fuel growth in Nihon Enterprise's businesses from fiscal year May 2017 onwards, combined with its participation in the smart community concept project.